It was last week when the community I made my home in Second Life had to deal with a griefer. This wasn't the run of the mill "rezz annoying particles and run" griefer who've I used to see hit sandboxes and social spots. Apparently in the past he stalked one of my neighbors until he was finally banned and laid low for a time. Then through a female alt, he contacted me about a club "she" was part of the staff of that might deserve a write-up. Then some days later through another alt asked about possibly DJing at a club I help manage for a friend, saying "she" could help the club have events on two more days during European hours. We accepted. She also talked to the two people who ran the community's largest club, saying she could do Sundays. She was also accepted. I'd been talking to this person over Second Life, Skype, and Steam for a few weeks. Then things unravled in a matter of hours. Apparently he spooked the one he'd been originally stalking. He then complained about her and a friend of hers breaking the rules to get at her, and told me not to interfere. As this involved the club, I was obligated to at least tell the owner. The person then told me I was being reported to Linden Lab, "Enjoy being banned from Second Life." Having been around a while, I had a good idea what the Lab could potentially ban someone for, and what people were free to do completely. My response to him, "You know, that was almost amusing. Almost." That didn't make him too happy. He continued to make trouble, cursing and insulting anyone in the community's groups who inquired what was going on. In the end, he was banned from every sim and group. As word spread, this particular account was banned in at least two other communities as well. One possible account over his Skype contacted me later, claiming he'd been hacked. And another account in Second Life IMed me the next day asking to be on each other's lists in Steam, though the name the person gave was suspiciously like the griefer's. Nothing the next day finally. While many griefers grow out of their path of misdeeds, this one refuses to change his ways. This person has caused enough trouble for others to write pages on the web just for him, including one that hinted he was evidence that science-fiction/fantasy fans are sexually depraved freaks. I won't honor this chronic troublemaker by mentioning his name, though many reading this will figure out who he is. So what could we have done to avoid all this? In retrospect, if we wanted to remain a friendly and open community, not much. Yes, groups and their sims can put up walls, not allowing anyone they don't know in. But that's a good way to ensure that a place eventually fades away as real life causes people to eventually drop out of Second Life, and eventually there are too few people to sustain the land. Fortunetly, most communities are open. Most people want to be friendly. Most want to give others, including the newbies, a chance. But unfortunetly that means the occasional jerk will see this openess as an invitation to stir up trouble. 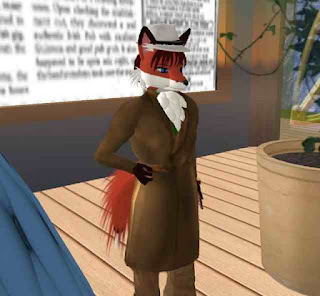 There's no doubt the people who created Second Life were brilliant at what they knew. And what they knew was how to create a virtual world. But when it comes to predicting human behavior, they seem to be again and again taken by surprise. The early Linden Lab predicted Second Life would become a land of adult learning, filled with places like the Sci-Lands and language institutes. That people would come in to use virtual reality to indulge in baser desires such as gambling and sexual fantasies took them completely by surprise. While they did include on the terms of service no harassment of others, it seems they didn't quite prepare for things like particle attacks. One live broadcast from Second Life was interrupted when one griefer caused a bunch of flying male organs to fly across the screen. The infamous "flying penises" interview hurt Second Life as this bad publicity stained it's image to those outside. It's also part of the reason the twitch streaming service doesn't allow users to broadcast from Second Life. But that's just part of the damage griefers can do, especially when unchecked. While many are content to merely harass, there has been at least one occasion in which griefers launched a continuing barage of attacks on a club as part of an extortion scheme. Linden Lab was no help, even allowing the sale of the "sim crashers" on Marketplace. The only thing the club could do was "hunker down" and limit traffic to those not in their group to a tiny area on their land, handing out invitations once people wanting in were cleared. This would go on for weeks until the extortionists finally gave up and moved on, but not without much revenue being lost by the shops on the land due to disrupted traffic. More commonly, griefers can disrupt the Second Life experience of people by causing people to be on the watch for them. Some sensitive friends of mine have become afraid of being harassed and stalked, and are reluctant to venture outside a few familiar areas they feel safe in. With griefers making use of newcomer alts most of the time, the response has been suspicion by some of anyone new. I've heard of places that won't allow anyone with an account under thirty days in at all. With all the talk about how to attract people to Second Life, it isn't hard to imagine a newcomer getting frustrated from being eyed with suspicion, "The heck with this, I'll just head on to World of Warcraft!" Linden Lab could make it a requirement for one to provide real-life information when making an account. But with hackers in the news time to time, such as when some published a list of those using a website for affairs, if you're someone worried about an identity thief cleaning out your account or a woman scarred to death about the thought of a stalker, this option is not one that lets you rest well at night. A few days before the griefer was thrown out, someone new to Second Life dropped in our community. After the mess, At least one wondered if this was a coincidence. But I had talked for some time with the newcomer, and didn't get the "feel" I had with the troublemaker. So she was left alone, and as time went on, there was no trouble from her. If she was suddenly blocked, that would have meant the loss of a new friend. Sadly it seems, just like jerks are a part of real life, griefers are a lasting part of Second Life. The best thing one can do is not panic, keep a clear head, and keep from one's heart from being hardened. The infamous zFire Xue of Redzone turned out to have a history of misdeeds in real life as well as Second Life, and ended up paying the price in real life as well. Hopefully this character, and other incurable griefers, will end up sharing his fate. Unlike PDF methods our unique guide works in-game, to always tell the player what to do, step-by-step. Tantari Kim's "Journey of Sound"